When I last reviewed Ben Lane’s live performance, I was impressed by his energy, sense of fun and varied repertoire of covers. 'Blue the Fuse', his recent album, is all original material, yet the variety on offer here pays homage to those tastes and influences, melding into an enjoyable and admirable body of work. The album begins with the wonderful harmonica-laden ‘Last Bean in the Can’, a catchy tune that has elements of country and blues, and Jesse Hutchinson’s guitar work seals the deal on a delightful opener. 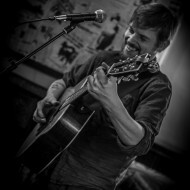 Mat Harrop’s harmonica makes a reappearance in later tracks and really accents the bluesy feel, with some particularly wonderful sections in ‘Nothing But Love’, whilst ‘Backstreets’ is a more acoustic guitar-based, pared down piece, with the realisation becoming clear that Ben has a fluid ability to switch vocal gear and tone. There’s still an Americana feel flowing through, and some playful literary references in the lyrics here too. ‘Day to Day (on my Mind)’ features some beautiful flute work from Rob Mackay; paired with the guitar here, they combine to create a melancholic delight. ‘Hurricane Room’ represents a shift from the acoustic blues, bringing a heavier undertone that evokes some great 80’s rock tracks, Tom Townsend’s percussion and Emi Rizzi’s guitar perfectly complementing another level to Ben’s chameleon vocals. ‘Cry Just a Little Bit’ takes that reinvented eighties vibe to a bluesy pop place, with social and environmental messages Sting and Geldof would no doubt approve of and a chorus that’s irresistible. Simon Coles provides the string arrangement and piano, adding depth and dimension to a meaningful track. There’s almost a sense of many of the themes throughout coming together to the conclusion in ‘Plan B’, and as well as being a great listen simply on the musical level, the lyrics throughout leave you with a little to think about, without in any way labouring a message or being hard work – it just flows, artfully.